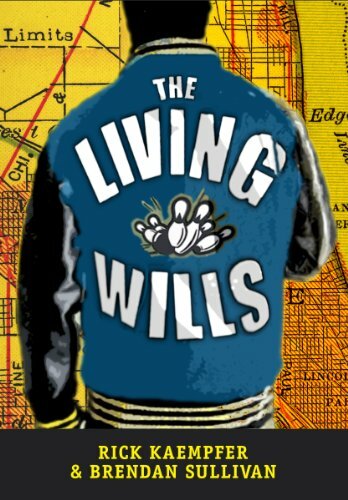 Recently, I read The Living Wills, which is a novel that at first seems disparate because it opens up with various characters that you think are disconnected, but in the end have some important connections. Also, you find out what is up with Henry, a Vietnam vet, whom you meet at the beginning of the story and who seems like a minor character, but he is not, and you see how people and events swirl around him. Basically, he had an experience in Vietnam that changed him forever, and he affected other people along the way. At the beginning, the story seems slow and details unnecessary, but they end up making sense because mysterious elements are revealed as the story unfolds. The book is written well and is entertaining. I wouldn't be surprised if it ends up becoming a movie. I interviewed the two guys who wrote the book together: Rick Kaempfer and Brendan Sullivan. Why did you choose to write a book together? Brendan: I pitched the idea to Rick to use the collaborative creativity techniques I teach my corporate clients to use, to apply these concepts to create a novel. It was an experiment. We used improv, brainstorming, mind mapping and other ideation tools. Rick: Honestly, it was an experiment in my mind. I knew that Brendan and I got along, that our writing styles were similar, and that we were both pretty open minded. It seemed like a good pairing to me. Brendan: I first pitched the idea to Rick in January 2009. The book was published in December 2011. How did you know how to edit your ideas into a coherent story? Brendan: ...Lots of editing, reading one another's stuff, having pre-readers give us feedback, and then feedback from a professional editor. Brendan: My mother was a strong inspiration. She always told me I could do whatever I set my mind to, and she instilled in me a strong sense of family, which is a theme of the book. Rick: And for me, it was my dad. He died when I was in my 20s, before I was married or had kids, and I didn’t really start writing until he was gone. I wanted to chronicle things for my own kids so that they would know what their father was thinking—if like my own dad—I’m not around when they finally care what I have to say. That process unleashed a passion for writing in me. That’s why Brendan and I dedicated the book to his mom and my dad. How did you come up with the plot? Brendan: We generated way too much initial content and lots of three-dimensional characters, then filtered it. We had long ideation sessions loaded with wild ideas, we filled flipcharts with all sorts of possibilities, and then chose those that fit together the best. Rick: That’s true. We really did create the characters before we created the plot. I think that’s probably an unusual way of doing it. But by the time we started working on the plot, we knew these characters like the back of our hands. That made the plot easier to create, and took us in directions that we never would have gone if he had written the plot first. Did you know the ending before you wrote the whole thing? Brendan: We had all 60 or so chapters beated out before we began to write a first draft of the novel. This helped us avoid painting ourselves into a corner. It was crucial that we knew where we were going. We made some changes along the way, but the main structure of the story was set in the first six months of the process, before we typed "Chapter One" on a page. Rick: Right. We knew the ending, but as it turns out, we didn’t really know what we would find during the writing process. We found all sorts of things, including the main message of the book, which emerged organically. That was a real revelation to me. The book seems like a weaving of different people and stories that eventually come together and make sense. Why did you decide to have it unfold like that? Brendan: That structure evolved from the creative process. We began by generating a LOT of story lines, and then we considered which ones were most viable and how these might intersect. We chose three stories. It loosely follows the improvisational theater form called the "Harold" where three scenes begin separately and over the course of a live performance, intersect to become one piece. Rick: I’ve always been a fan of the kind of novels that have intersecting story lines like this. One of my favorite things about Dickens (my favorite writer) is that he has his characters turning up in unusual and unexpected parts of the story. That appeals to me as a reader, so I thought it would be fun as a writer too. Did you wonder if the reader would be patient for the story to unfold instead of including a clear inciting incident that fiction seems to have? Brendan: There was a concern that some readers might read the first few chapters and be confused because each of those early chapters appears to be disconnected from the others. The payoff is for those readers who have stuck with it past the first three chapters. Readers have consistently told us that the slow unfolding and connecting of the stories was an enjoyable revelation. Rick: We have heard from a few people that it took awhile to get into it. It’s a pretty complex story. But if you trust that your questions will be answered, you will not be disappointed. Why have several characters instead of one main one? Brendan: Well, again I don't believe it was a conscious choice but something that evolved from the process. If there is a lead character, it would be Henry, whose life touches all of the others in a profound way. The story is about relationships, and how everything is connected. Three story lines required a lot of strong characters. Rick: That’s true. I consider Henry the lead character too. He is the glue to this story—the thing that ties them all together. How did you know readers would be able to relate to the story? Did you have an audience in mind? Brendan: The story is about normal, real people dealing with real challenges. These are the people I have observed all my life, doing things anyone can relate to. We didn't have a particular audience in mind because we didn't want to change anything just because it would be "more marketable." That didn't seem honest. So there are no teenage vampires in the book, as much as we knew that it might sell a few more copies. Rick: Shhhhhh! There are all sorts of teenage vampires in this book. I don't know what Brendan is talking about. Teenage vampire fans should buy hundreds of copies of "The Living Wills" and distribute it to their friends. Why did you choose Vietnam as a prominent part of the story? Brendan: Our character, Henry, needed to be affected by a powerful event to explain his ensuing actions and decisions throughout his scattered adult life. Vietnam fit. I've also always been impressed by the 'silent warrior' who does his duty for his country and doesn't want to be treated as a hero, who would rather just move on. Of course Henry can't really move on, although he would also never admit that. Rick: Both Brendan and I are a little too young to have been in Vietnam, but our generation was definitely influenced and touched by it. We all know people that served. For me, it was my Uncle Manny. We used to send him audio tapes so that he could get a taste of home. I’ll never forget the day he came home safe and sound. The book is good--how did you learn how to write so well? Brendan: Thanks! Personally, I read a lot. I think a writer learns from other writers. I've always enjoyed the power of the written word to move people, to make them laugh and cry. One way or another, I've been writing for over 40 years now. I couldn't have written this when I was 20 or 30 or 40 years old. I wasn't ready. Rick: It’s funny, but English isn’t even my first language. I couldn’t diagram a sentence to save my life. But I’ve always been able to tell a story, and to me that’s what writing is all about. What did you learn from this creative process? Is there anything you learned not to do? Brendan: I learned that it can work. Two independent, professional, creative individuals can come together and create a novel. Two heads, in this case at least, are indeed better than one. I learned not to get too attached to any material, and to not let my ego get in the way. Rick: I also learned how valuable it could be to have another set of eyes looking at it the entire way. We do look at things slightly differently, and he saw some things that I didn't see--and vice versa. As for what not to do, don't try to start giving names of characters to nieces and nephews and in-laws. You're bound to forget someone, and then you'll just have to write another book to make up for that. Do you plan on writing another book together? Brendan: I would very much like to try it again, knowing what we know now. Rick: I’d like to give it a shot too. I think first we’re going to tackle the screenplay to this book. We’ve already had a few inquiries from filmmakers, and that has given us the kick in the pants we need to get going on that.